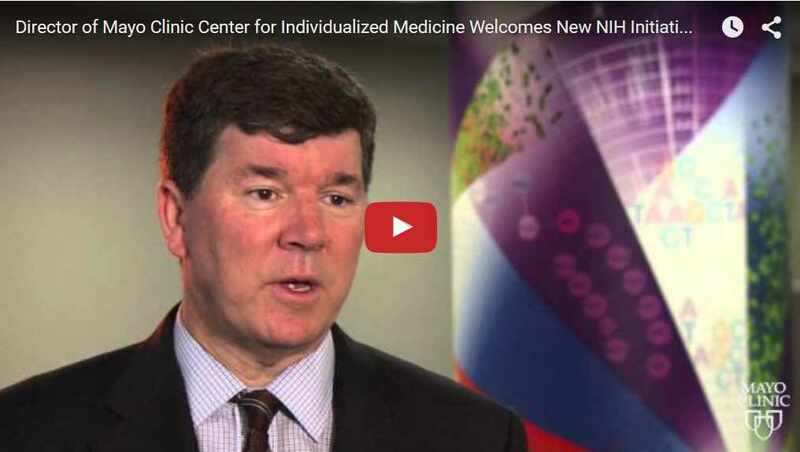 Dr. Keith Stewart, director of the Mayo Clinic Center for Individualized Medicine, discusses the National Institutes of Health (NIH) announcement this week of a new framework for beginning to collect and decode the genetic information of a huge sampling of Americans. The National Institutes of Health (NIH) announced a new framework this week for beginning to collect and decode the genetic information of a huge sampling of volunteers over the next three years in an effort to improve health care at an individualized level. Called the Precision Medicine Cohort Initiative, it's part of the President's Initiative on Precision Medicine announced earlier this year. The director of the Mayo Clinic Center for Individualized Medicine, A. Keith Stewart, M.B., Ch.B., welcomes the announcement. "This is a project to take the DNA of one million Americans, across all walks of life and diversity of populations, and to sequence the genome of each of those individuals and then follow them over time to understand what the genome could tell us and what it could predict about our future health," says Dr. Stewart. "It’s a highly important project." The NIH says $130 million of the $215 million budgeted in fiscal year 2016 for the President's Personalized Medicine Initiative is allocated for development of the participant cohort, meaning the group of patients who will be involved in the research. To read the full NIH news release on the program, click here.